In 2018 NPU-QMUL Summer School,QMUL offered us a really special and cool welcome–a participation in an activity which was called "Treasure Hunt". We were handed out a sheet of paper with questions to each group and the answer to each question was about a place in QMUL. We were demanded to finish the questionnaire and took a picture of these places. Most of the questions were about the functions of the places in QMUL. Hence, it was a significant way for us to become familiar with QMUL and practice our communication skills because of the need to ask the locals for help. At first, three Ph.D students led us to travel around the QMUL. Each Ph.D student led two groups to visit the campus and told the general functions of each building. The students of each group were full of passion to ask questions which were not only about the university, but also about the career of the Ph.D students. Then, we came to the start point to begin to hunt "treasure". Some of the answers were easy to guess, while others were not very clear. Therefore, all the groups went smoothly in the beginning, but they did meet some difficulty. For instance, CBO2 was an abbreviation of a room in Queen's building. Not only many students but also many locals were confused about this. But this was not a problem for our brilliant students. There were some extraordinary performances in the activity. Group 6 found the information desk and determined the meaning of the unclear questions during the activity. Group 2 performed an amazing dance in art two building. All the groups were attracted by the cute of the ducks along the river. The most important part was that students explored how to interact with the locals and their group members. It is hard to provide a clear definition to what we feel about this "Treasure Hunt". The most impressive thing is not the process itself but the people we met during this process. The people we encountered really offered plenty of help to us, no matter they are familiar with QMUL campus or not. There are plenty of "Shining points" during our "Treasure Hunt". The most impressive moment that caught our attention was the time when we asked for the assistance from the strangers. All the people that we politely bothered such as workers, teachers, professors and students from different countries and regions, were all passionate and devoted to help. They did not have any prejudice to foreigners and they showed their enthusiasm and high respect to us newcomers. We met a zealous receptionist in the Queen’s Building. Although she had many documents to fill and was busy with answering telephones, she was still warm and helped us finish almost 50% questions patiently. Her assistance touched us deeply and we realized the necessity of understanding and empathy during the communication. In addition, by searching in the SEMS building, we found our teachers' offices surprisingly. It was interesting to imagine how our teachers work in their offices and prepare significant lectures and presentations for us. During the "Treasure Hunt", not only did we find different places that used to appear on the publicity posters and photos, but we learnt about the culture of the QMUL and form a basic picture about the characteristics of the British people as well. We realized that people here are friendly and warm-hearted which, in our mind, can be regarded as epitome of British people. Their attitude to the strangers and foreigners is so positive and open-minded that may be a pillar reason for their rapid development of globalization and internationalization. Looking back on our precious experience of working in group during the "Treasure Hunt", we found that there are both strengths as well as weaknesses. As for the positive effect, the effective group-working helped us analyze from different aspects and avoid unnecessary mistakes. During the communication, we learnt from others and made decisions thoroughly. However, we were also faced with disagreements and sometimes become less effective. Even so, group-working still plays an important role during our "Treasure Hunt". As a precious ability, it is acknowledged that group work should be utilized in our daily life and help to improve ourselves. By group work, we can assess risk quickly and find creative solutions. We can also create masterpiece under time pressure and communicate creatively. This activity improves our group-working skill in many aspects. To summarize, "Treasure Hunt" is a significant activity that helps improve our communication skills and group-working skills. 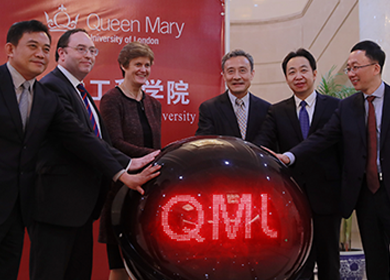 By exchanging ideas with each other, we have got familiar to the life in QMUL and created a fundamental impression of London. This activity has truly exerted a positive impact on our following days' exploration to this city and helpedus learn the similarities and differences between the tangible and intangible Chinese culture and British culture, especially in the transportation, architecture and humanity.